A small, displaced house stuck to the side of a building like some sort of parasite, both separate from and dependent on the larger structure. 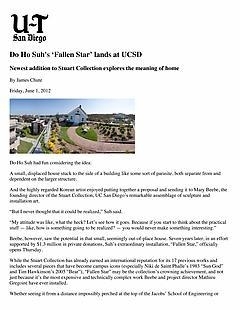 And the highly regarded Korean artist enjoyed putting together a proposal and sending it to Mary Beebe, the founding director of the Stuart Collection, UC San Diego’s remarkable assemblage of sculpture and installation art. “But I never thought that it could be realized,” Suh said. Beebe, however, saw the potential in that small, seemingly out-of-place house. Seven years later, in an effort supported by $1.3 million in private donations, Suh’s extraordinary installation, “Fallen Star,” officially opens Thursday. While the Stuart Collection has already earned an international reputation for its 17 previous works and includes several pieces that have become campus icons (especially Niki de Saint Phalle’s 1983 “Sun God” and Tim Hawkinson’s 2005 “Bear”), “Fallen Star” may be the collection’s crowning achievement, and not just because it’s the most expensive and technically complex work Beebe and project director Mathieu Gregoire have ever installed. Whether seeing it from a distance impossibly perched at the top of the Jacobs’ School of Engineering or experiencing it seven stories up from the inside, where everything in its comfortably furnished single room seems precisely in place and dangerously out of kilter at the same time, you immediately get it. “One of the reasons the experience of this work is so amazing — besides the disorientation one feels and has to adjust to — is the attention to detail which is true of all Do Ho’s work,” Beebe said. “And just the sight of it is so unexpected from the ground and from the seventh floor window (when you exit the elevator). Displacement has been a central theme of Suh’s work ever since he left his native Korea and came to the U.S. in the early ’90s. His art, which has been exhibited worldwide from the Los Angeles County Museum of Art to the Tate Modern in London, is informed by his initial alienation, disorientation and longing for home, whatever home is. “That’s my question,” Suh said. “Since I left home to come to the states, these (artworks) are all part of my quest to find out: What is the meaning of home? What is home? It’s a way to find the answers, through the projects. When he first moved to Providence, R.I., to attend the Rhode Island School of Design (“Fallen Star” is inspired by a house close to where he lived), an uneasy Suh wasn’t so much concerned with making art as he was with adapting to his environment. He started to explore and understand the space around him by taking measurements with a tape measure, even if the translation from meters to inches was just another reminder of the many differences between his old home and his new home. Upon graduation, he moved to New York, where he was equally uncomfortable living in Manhattan. As he continued his measurements, he started to wonder if there was a way to re-create the space he felt comfortable, his home in Korea, in New York. “It was not really an art project at the beginning,” Suh said. “I was thinking, how can I bring my home in Korea” to New York? His house in Korea was larger than his apartment, so there was no way to make it fit. But after leaving New York to earn a graduate degree at Yale, he found a solution. An award from the Korean Cultural Center brought with it an exhibition in Los Angeles and enough space to re-create his Korean house in fabric (an idea inspired by the mosquito netting that had been common to him while growing up). The installation traveled widely and included a stop in New York, where Beebe saw it. “When I came across Do Ho’s work in the late ’90s ... it was this house, the skin of a house, actually, floating in the sky,” said Beebe. “It was a replication of the house he grew up in, because he had come to this country ... and he felt like he had been dropped from the sky. He had to completely readjust his whole outlook. Beebe asked Suh to submit a proposal to her and the Stuart Collection’s advisory board, and he was enthusiastic about the possibility of creating something that would be a “real” house, not just an imitation made of fabric. And he welcomed the opportunity to work on campus. His approved proposal, however, was for the side of Urey Hall, whose occupants had security concerns (as visitors would have to walk through the labs to reach the house) and asked Beebe to find another site. Suh, Beebe and project director Gregoire finally settled on the roof of the engineering building, with the enthusiastic blessing of the department, and Suh reconfigured his original proposal to allow the three-quarter scale house to jut off the building’s roof. He also incorporated a garden that had been part of one of his earlier, alternative proposals. Although the house was constructed on the ground and lifted to the top of the engineering building in November, it’s taken another six months to furnish the house and install the garden. “Fallen Star” is among Suh’s most “permanent” works, but the garden ensures an element of impermanence. Given the engineering involved, however, and house’s steel and concrete infrastructure, “Fallen Star” is going to be up there for the foreseeable future, affecting generations of viewers. It has already affected Suh.